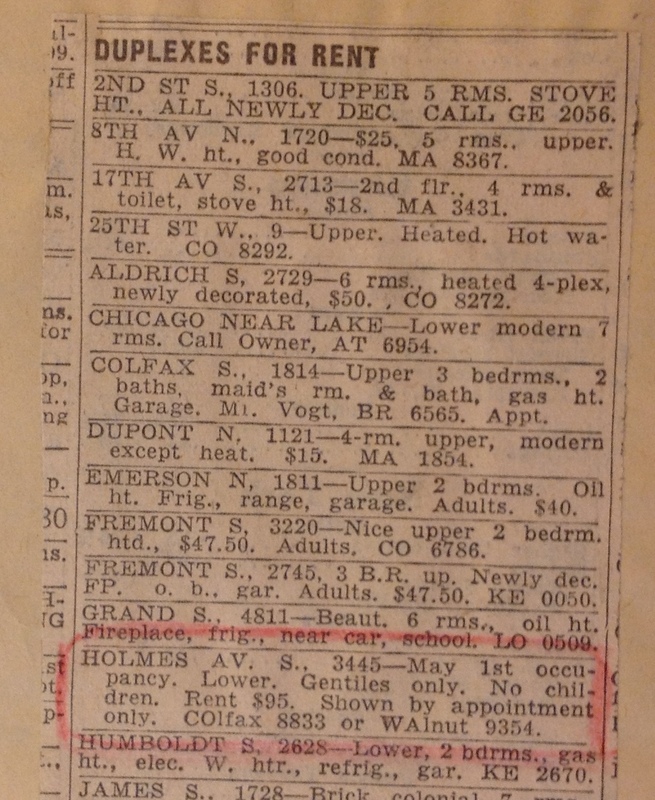 Rental Advertisement from the Minneapolis Morning Tribune March, 1942. Commentators speculated on the origins of this prejudice, settling on another set of ethnic stereotypes for explanation. 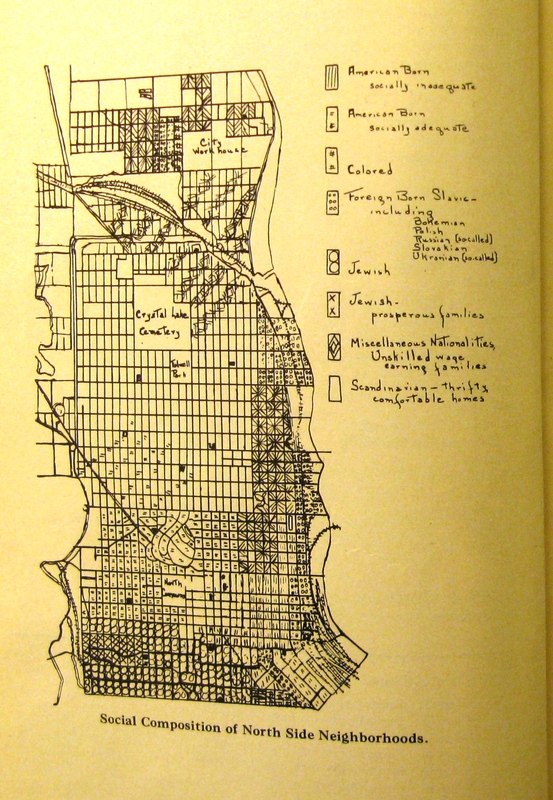 They blamed Scandinavian “clannishness”; Lutheran hostility toward other religions; and Yankee “aloofness.” They singled out the city’s trade unions for racism. They decried the influence of evangelicals like William B. Riley and Luke Rader, who mixed biblical prophecy with anti-Semitic bile. Religious intolerance in the isolated “Gateway to the Northwest” would probably never drawn national attention without the efforts of local Jews, who organized in 1938 to fight a rising tide of anti-Semitism. Jews had long been scapegoats. But the rise of Hitler and anti-Semitic totalitarianism re-cast this rhetoric. In the wake of a bitter election campaign that turned on anti-Semitic propaganda, Mill City Jews concluded that countering these prejudices was a matter of survival. Out of this resolution grew the Jewish Council of Minnesota, which appointed Samuel Scheiner as its first director. Charged with documenting incidents of anti-Semitism, Scheiner crusaded against bigotry in the community for three decades. He fought many battles on the terrain of property and real estate, where racism was firmly institutionalized. Scheiner reported that Turner withdrew his advertisement. Perhaps the landlord had secured a tenant who met his criteria. But even if Turner had recanted his prejudice, the retraction of this ad would have been a minor victory in a long-running battle for tolerance. 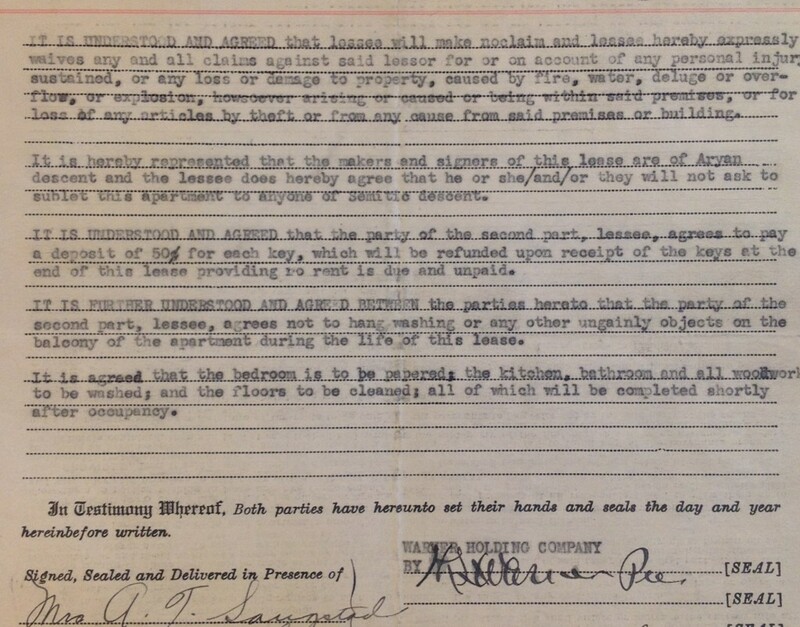 Lease for Dupont Court Apartments, 1939. Images and correspondence are from the Council Records of the Jewish Community Relations Council of Minnesota at the Minnesota Historical Society.